Australia briefly became an independent state during the Whitlam years, 1972-75. An American commentator wrote that no country had „reversed its posture in international affairs so totally without going through a domestic revolution“. Whitlam ended his nation‘s colonial servility. He abolished Royal patronage, moved Australia towards the Non-Aligned Movement, supported „zones of peace“ and opposed nuclear weapons testing. Although not regarded as on the left of the Labor Party, Whitlam was a maverick social democrat of principle, pride and propriety. He believed that a foreign power should not control his country‘s resources and dictate its economic and foreign policies. He proposed to „buy back the farm“. In drafting the first Aboriginal lands rights legislation, his government raised the ghost of the greatest land grab in human history, Britain‘s colonisation of Australia, and the question of who owned the island-continent‘s vast natural wealth. Latin Americans will recognise the audacity and danger of this „breaking free“ in a country whose establishment was welded to great, external power. Australians had served every British imperial adventure since the Boxer rebellion was crushed in China. In the 1960s, Australia pleaded to join the US in its invasion of Vietnam, then provided „black teams“ to be run by the CIA. US diplomatic cables published last year by WikiLeaks disclose the names of leading figures in both main parties, including a future prime minister and foreign minister, as Washington‘s informants during the Whitlam years. Whitlam knew the risk he was taking. The day after his election, he ordered that his staff should not be „vetted or harassed“ by the Australian security organisation, ASIO - then, as now, tied to Anglo-American intelligence. When his ministers publicly condemned the US bombing of Vietnam as „corrupt and barbaric“, a CIA station officer in Saigon said: „We were told the Australians might as well be regarded as North Vietnamese collaborators. 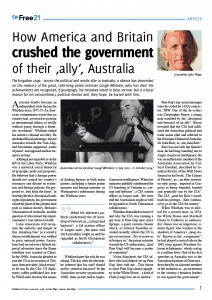 “ Whitlam demanded to know if and why the CIA was running a spy base at Pine Gap near Alice Springs, a giant vacuum cleaner which, as Edward Snowden revealed recently, allows the US to spy on everyone. „Try to screw us or bounce us,“ the prime minister warned the US ambassador, „[and Pine Gap] will become a matter of contention“. Victor Marchetti, the CIA officer who had helped set up Pine Gap, later told me, „This threat to close Pine Gap caused apoplexy in the White House... a kind of Chile [coup] was set in motion.“ Pine Gap‘s top-secret messages were de-coded by a CIA contractor, TRW. One of the de-coders was Christopher Boyce, a young man troubled by the „deception and betrayal of an ally“. Boyce revealed that the CIA had infiltrated the Australian political and trade union elite and referred to the Governor-General of Australia, Sir John Kerr, as „our man Kerr“. Kerr was not only the Queen‘s man, he had long-standing ties to Anglo-American intelligence. He was an enthusiastic member of the Australian Association for Cultural Freedom, described by Jonathan Kwitny of the Wall Street Journal in his book, ‚The Crimes of Patriots‘, as, „an elite, invitation-only group... exposed in Congress as being founded, funded and generally run by the CIA“. The CIA „paid for Kerr‘s travel, built his prestige... Kerr continued to go to the CIA for money“. When Whitlam was re-elected for a second term, in 1974, the White House sent Marshall Green to Canberra as ambassador. Green was an imperious, sinister figure who worked in the shadows of America‘s „deep state“. Known as the „coupmaster“, he had played a central role in the 1965 coup against President Sukarno in Indonesia - which cost up to a million lives. One of his first speeches in Australia was to the Australian Institute of Directors - described by an alarmed member of the audience as „an incitement to the country‘s business leaders to rise against the government“. The Americans and British worked together. In 1975, Whitlam discovered that Britain‘s MI6 was operating against his government. „The Brits were actually decoding secret messages coming into my foreign affairs office,“ he said later. One of his ministers, Clyde Cameron, told me, „We knew MI6 was bugging Cabinet meetings for the Americans.“ In the 1980s, senior CIA officers revealed that the „Whitlam problem“ had been discussed „with urgency“ by the CIA‘s director, William Colby, and the head of MI6, Sir Maurice Oldfield. A deputy director of the CIA said: „Kerr did what he was told to do. “ On 10 November, 1975, Whitlam was shown a top secret telex message sourced to Theodore Shackley, the notorious head of the CIA‘s East Asia Division, who had helped run the coup against Salvador Allende in Chile two years earlier. Shackley‘s message was read to Whitlam. It said that the prime minister of Australia was a security risk in his own country. The day before, Kerr had visited the headquarters of the Defence Signals Directorate, Australia‘s NSA where he was briefed on the „security crisis“. On 11 November - the day Whitlam was to inform Parliament about the secret CIA presence in Australia - he was summoned by Kerr. Invoking archaic vice-regal „reserve powers“, Kerr sacked the democratically elected prime minister. The „Whitlam problem“ was solved, and Australian politics never recovered, nor the nation its true independence. Previous story Video: War or peace in Europe? Time to break the silence!